Il Best Western Oak Meadows Inn è situato nel centro di Saint Helens. L'hotel è vicino alle principali attrazioni turistiche. Approfittate tutto l'anno del miglior prezzo garantito e di offerte esclusive. La nostra hall è il luogo ideale per stare con la famiglia o incontrare gli amici. Tutte le camere sono dotate di microonde e frigorifero. Contattaci per verificare le tariffe e prenotare una delle nostre sale meeting. Benvenuto al Best Western® Oak Meadows Inn!Il nostro hotel di Saint Helens è situato lungo il fiume Columbia ed è molto apprezzato per una vacanza con tutta la famiglia o per soggiorni in occasione di partite o tornei sportivi scolastici. L'hotel si trova a un'ora di distanza da Woodland, Washington. Gli enti militari, gli uffici dello stato dell'Oregon, il Department of Human Services, l'armeria della Guardia Nazionale e gli uffici governativi sono situati tutti nelle vicinanze del nostro hotel di Saint Helens. Per questo la zona è frequentemente meta sia di viaggiatori d'affari, sia di turisti. Che tu ti trovi in città per praticare sport acquatici lungo il fiume Columbia, per un evento speciale o per una riunione, il nostro hotel di Saint Helens rappresenta la combinazione perfetta di qualità e convenienza. Vicino alle sedi aziendali e alla tua famiglia, potrai trascorrere una vacanza favolosa. Il nostro hotel di Saint Helens dispone di piscina e vasca idromassaggio, ideali per rilassarsi. La nostra famosa colazione all'americana completa gratuita è un altro motivo per cui tanti ospiti tornano a trovarci. Potrai iniziare alla grande le tue giornate gustando uova, vari tipi di pane, pasticcini, cereali, yogurt, caffè 100% qualità arabica e succhi di frutta. La pesca e le escursioni in kayak sono tra le attività più diffuse nelle vicinanze del nostro hotel di Saint Helens. Se invece non ti interessano gli sport acquatici, potrai approfittare dei bellissimi negozi di antiquariato del centro storico. Che tu desideri un'avventura o andare alla scoperta di ciò che la zona ha da offrire, il nostro hotel è vicino a tutto. Nel nostro hotel di Saint Helens accogliamo spesso non solo dipendenti statali ma anche viaggiatori d'affari che si trovano in città per lavorare con Dyno® Nobel, Armstrong® World Industries e la locale compagnia ferroviaria. Offriamo ai nostri ospiti una posizione comoda tra Seattle e Portland. Dalla fiera della contea di Columbia ai 13 giovedì sera di musica dal vivo durante i mesi estivi, ce n'è per tutti i gusti vicino al nostro hotel di Saint Helens. Grazie a un personale cordiale e ospitale e a camere spaziose il nostro hotel è una scelta ideale. Prenota una delle camere comode e pulite del Best Western Oak Meadows Inn, dove il confort incontra la qualità! They have remodled the motel and it is very nice and comfortable. Very nice in the rooms with nice furniture. Found it to be a friendly staff. Good parking area. 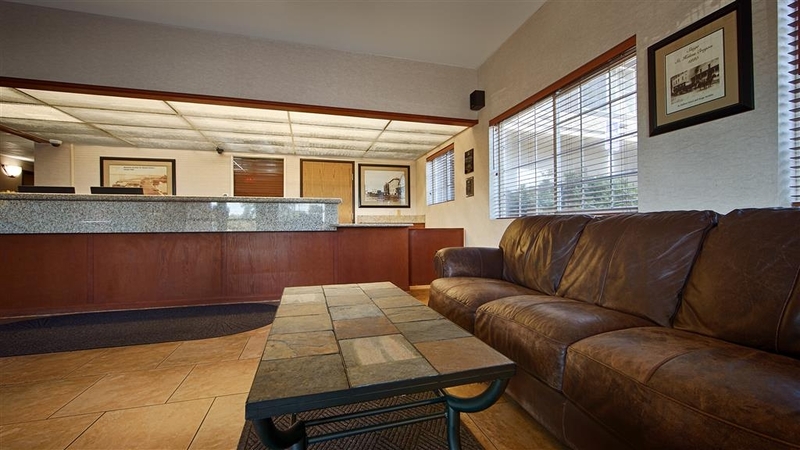 The reception area was very clean and accomdating. Fresh drinks in the lobby and easy check in. Thank you so much for giving us a review it is greatly appreciated. I hope you enjoyed our new look since the remodel in March. If you are in the area again we would love for you to stay with us again. Thank you for your review it helps us make this a better Best Western. The hotel was very nice. The beds were comfortable. The pool was a wonderful temperature. Breakfast had a lot of good options to pick from. The only thing I would change is the sign out front. We passed the driveway the first time because it was hard to see the sign. Thank you so much for giving us such a nice review it is greatly appreciated. I hope you enjoyed our new look since the remodel in March. If you are in the area again we would love for you to stay with us again. Thank you for your review it helps us make this a better Best Western. The staff at this Best Western consistently goes out of their way to help guests make their stay more comfortable. From the awesome check-in with Codie to the breakfast staff to the warm cookies at night, the service was outstanding. Rooms are good with a fridge and microwave. Codie also checked us out and took care of us with ease and excellent service. Thank you Best Western staff!! Rooms were clean and quiet. The rate was not raised on the weekend - same on Thursday as Friday. Noisy refrigertors are my pet peeve and I was able to turn the one in the room off. Heater worked well. Good parking. There was a hot breakfast but it was mediocre. Shower was lukewarm. I gave them an "average" rating for service because when we brought the problem to the attention of the front desk, they said there was a known problem with the hot water in our wing and didn't offer any apology or solution. Great Staff and Super Clean Hotel, Stayed here before and its the reason we came here again. Everything about Oak Medows is Great. Location, things to do in the area. Great places to eat are all within a mile of the Hotel. "Housekeeping leaves a lot to be desired"
We left our room at 11:30 am and when we returned at 8:00 pm, the room had not been cleaned, bed was not made, trash had not been emptied, etc. When I e-mailed the manager, Anna, she said she had talked to housekeeping and "apologized for the inconvenience". We were offered no compensation (bonus points or a free night might have compensated for this. Im sorry but I was told that the front desk had taken care of you when you came to the front desk. I will again do some more checking on this issue. Again so sorry for any inconvenience. "Great hotel stay during family loss." This Best Western was exactly what we needed during our trip to the Mount St Helen's area when we had a loss in the family. Very friendly staff, very clean large rooms, and a tasty hot buffet for mornings when we were on the run. We would highly recommend this hotel! Hotel was always clean. The breakfast was good with plenty of options. The staff is friendly. The only complaint would be the firmness of the mattress -- way too firm for my liking. Other than that this was an awesome place to stay! Nice, friendly, and clean hotel. Off Hwy 30 enough, so it was quiet. Enjoyed the hot tub. Solid breakfast. Bed was comfortable with a lot of pillows. TV was not huge, but not too small. Rooms were spacious, with a good couch. Shower was great. You know how there are often small, irritating things that go wrong with a reservation, or the place you're staying isn't as nice as it looks on line? Those things won't happen here. The facility is bright and clean, the staff are welcoming and professional, the rooms are spacious, clean, and nicely decorated. No complaints, and I've already booked a room for the next time I'm in the area. Other than the parking lot being a bit tight, this is a great value hotel for the region. Large clean rooms, decent breakfast (except the egg's were instant and watery), and right in the middle of St. Helens. Thank you so much for giving us such a nice review it is greatly appreciated. I hope you enjoyed our new look since the remodel in March. Our eggs are not instant they are real eggs with just a touch of citric acid to keep the color from turning the greenish/grey color. I dont want you to think we are giving you a subpar product. I will speak to the attendants to make sure to remedy this issue, so the product is more appealing thank you for letting me know. If you are in the area again we would love for you to stay with us again. Thank you for your review it helps us make this a better Best Western. 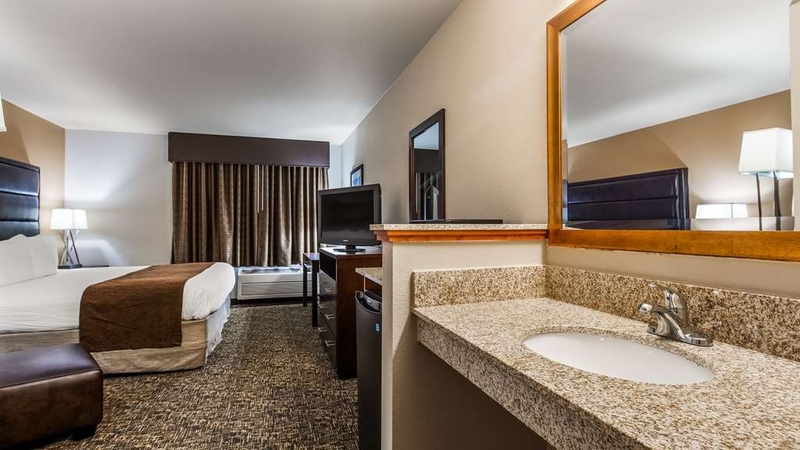 "BEST WESTERN AT ST HELENS OREGON"
it was a very clean place; great value and customer service, will stay here again in the future. they offer breakfast, but we were too busy to take advantage, but the fact it was there was very nice..
We were very happy with our stay here. The beds were comfortable, the room was tidy and the amenities were great. There was a full breakfast available, not just donuts and coffee. This was a huge help as it saved us time and money. My husband forgot his toothbrush and the front desk had new ones. This was another huge time saver (avoiding a store run) and very convenient. Overall, very happy with this stay. As our daughter just moved there, we have plans to stay here fairly frequently. The only "con" I would have is the driveway/entrance is really horribly located and very easy to miss even if you do know where you're going or what you're looking for. That's a fairly minor inconvenience given the overall value and experience we had there. 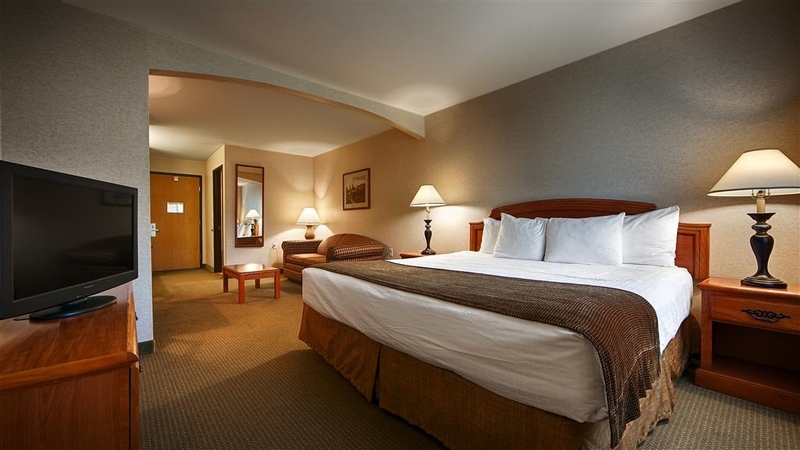 "Best Western in St Helens Oregon"
I found the hotel to be clean and the staff to be very polite and helpful. They also have an area out front for pets that is well taken care of. I would recommend this hotel to a family member and I would stay here again in the future. Food was good and room was so nice. check in person at this location seemed grumpy and did not smile but everything else was really good. Bacon, eggs, orange juice were really good but potatoes had too much garlic for our taste on them. Bed was so comfortable!!! Cleanliness and care for the guest needs to be the priority. Specifically booked a room with a pullout bed for a child and it was filthy. It did not appear it had been cleaned for weeks. Furthermore, the attention to detail on basic cleanliness was ignored. Lastly, the housekeeping staff threw away some of our property and paid no attention to what items were on the counter space and tables. Im so sorry for the issues you had with your stay. Thank you so much for bringing it to my attention so we can remedy the situation. I would like to take this time to apologize. 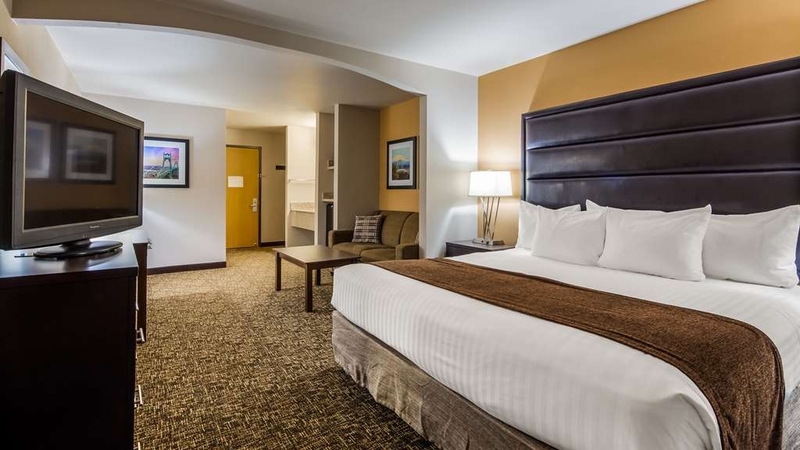 We need feedback like your to make this the best Best Western. Thank you for your time. "shopping for a new home in the area"
Room had such a strong odor of "perfume" used for cleaning, I had to use an inhaler to breathe. The room had fleas. Yes, I said fleas! There was dog poop in the hallway. A dog in the next room barked most of the night. Breakfast was the normal standard fare, but the eggs were cold, and the sausage looked like it was swimming in so grease. Check in was quick, and friendly. Check out not so much. Clerk gave me a dirty look when I mentioned the fleas. Said she would let them know, then gave me my paperwork. No thank you for staying, have a nice day or anything.Sorry to see this decline in what used to be a good place to stay. "Nice place with excellent customer service." A nice, clean, updated room. Pool and hot tub were nice and continental breakfast was good. Randal, the night clerk was awesome. He went above and beyond when he let me borrow his personal cell phone charger since I had forgotten mine. Thank you so much for giving us such a nice review it is greatly appreciated. 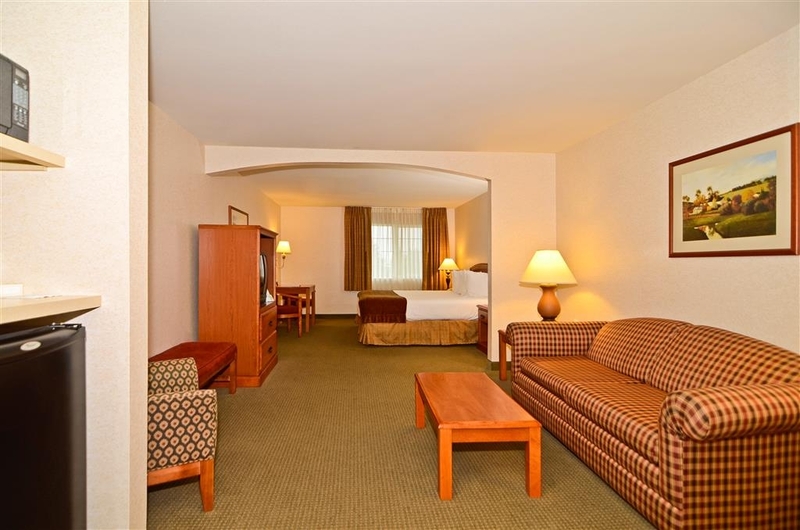 The rooms at this Best Western are done being remodeled, I hope you enjoyed our new look. If you are in the area again we would love for you to stay with us again. Thank you for your review it helps us make this a better Best Western. My family and I stayed in this best western for a weekend at halloweentown. The staff in this hotel was very pleasant and kind. The building is a little dated but they keep it nice and clean. Of the few places to stay in town this was a nice overall experience. "Nice Hotel in St. Helens"
Nice hotel in St. Helens. There are two. This is the Best. I feel their pet fee was a little outrageous. They charged me $20 per pet per night. That is $80.00 extra for two show kittens. I have stayed there every year for the cat show and have never left a mess. I take the litter and garbage with me when I leave. "Very good value, incredibly friendly staff"
Very good value, incredibly friendly staff. The gal at the front desk, CODIE, was super friendly and welcoming. Further, the gal who operates the breakfast area, DESIREE, is always so nice and it's a pleasure to wake up to a friendly smile and a kind "good Morning!" from her each time that I stay at this hotel. Amazing customer service! Codie and Randal made my stay stress free and comfortable. It was clean and housekeepers were great.. For sure coming back and staying here! Thank you Codie and Randal for everything! "Great value, Breakfast amazing, verify your room is clean"
The value of the room was great, Breakfast was soo very good. the lady in the breakfast room was so great and very friendly. Only issue was after getting in super late the next morning we discovered our room was not actually cleaned like it should have been. someone else hair in my bed and dried up gross washcloths in the shower. Im so sorry for the issues you had with your stay. Thank you so much for bringing it to my attention so we can remedy the situation. I would like to take this time to apologize. If you are in the area again we would love for you to give us another try. 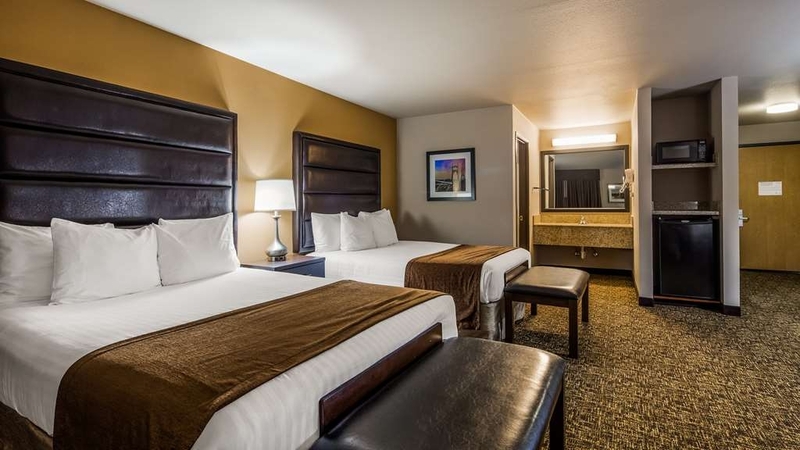 We need feedback like your to make this the best Best Western. Thank you for your time. we had the best sleep on the beds, so comfy. room was nice. Free breakfast buffet is always a plus and i always try to stay at a hotel with one. The parking lot had ample room for parking. The front desk staff was helpful. We were in town for a reunion. We made the reservation in advance. Every staff member we encountered was friendly. The breakfast was excellent. We like to be near a Starbucks and there is one close. The internet was great! There was an indoor pool. We weren't able to spend time at the pool but everyone we saw at the pool looked like they were having fun! All our needs were met! "Great place to stay for a cheap price !!" This is a good value hotel. The cost was well below the average for this standard of hotel. The over all experience of the hotel would be right up there with a low end Best Western Plus. I think with minimal effort they could reach the Plus status of their hotel chain. Codie Darmae at the front desk was just great. This was first staying at a Best Western and wouldn't hesitate to go back. She helped us with getting our fish ready to transport home. Room was clean, breakfast was fine, staff was really nice, nice place to stop on the road. Desiree has been a ray of sunshine every day for the entirety of my week long stay. She is always happy, chipper, and adds just that little something extra to breakfast time. The breakfast area was very clean, the food abundent, and hot. "Great spot in a small town"
I travel for a living and have pretty high standards. Oak Meadows was very clean, comfortable, modern and I was very impressed! The continental breakfast was one of the best I have had! Desiree was a great host and kept the food coming and hot! Lots of choices too! Thank you so much for giving us such a nice review it is greatly appreciated. 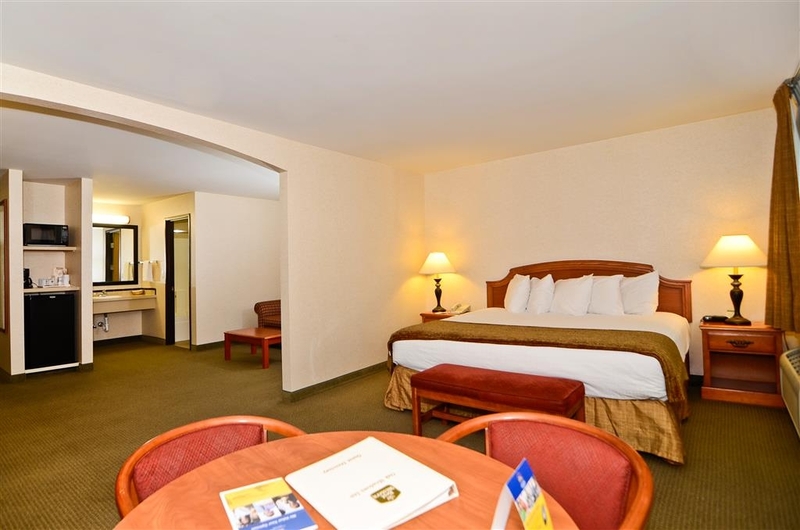 The rooms at this Best Western are done being remodeled, I hope you enjoyed our new look. Thank you so much for giving Desiree a shout out we are so proud of the job she is doing and I will make sure she knows it is being seen by the guests. If you are in the area again we would love for you to stay with us again. Thank you for your review it helps us make this a better Best Western. "An OK place to stay." Pre Booked for one night. They were going to put us on the second floor but they have no elevator, so the clerk quickly put us on the lower floor, one room from the end ofa long hall. Air conditioner was off when we arrive but the room was cool and the air worked great. Everything worked very well. Beds were comfortable. Minimal noise on Sunday night. We decided to sightsee in the area and confirmed a second night. On Monday night there was lots of banging doors, heavy steps on the floor above us, and other noises. Regardless we slept well (I wore ear plugs). The breakfast room was well laid out (except pastries in the corner were hard to reach). Waffle was good. Attendant friendly and keep things clean and stocked. Nothing outstanding about this place but would stay again. Stayed in their last available room which was a room equipped for physically challenged guests. Not as comfortable as a regular room but still ok. The front desk clerk was very nice and helpful. Breakfast was great, a very full breakfast. Cookies and coffee in the afternoon. Not a new hotel but definitely acceptable. Made the mistake of booking 2 nights at the Motel6 just to the west of the Best Western Oak Meadows in St Helens, OR. The Motel6 formerly Americas Best is not a 1/2 mile from the BW - but the M6 is a real dump - night and day difference to the BW. Lucky for my family the BW Oak Meadows is a great little place with clean and updated rooms - they took us after leaving the M6. Also a good breakfast is included. Stayed here as there are not a whole lot of choices in this area. First, there is NO ELEVATOR! what hotel in 2018 doesn't have an elevator when it is two or more floors? Nice pool and hot tub, average breakfast that was out of eggs when I arrived two mornings. AC unit worked great and it is a good thing as it was very hot here this week. Staff is excellent and accomodating. Thought the price was a bit high but again, only game in town! Bed was terribly uncomfortable. Look forward to getting home to a bed that doesn't kill my back. Would I recommend staying here?? YES! I will come here next time business brings me through St Helen. Thank you for completing the survey regarding your recent stay at our property. Your business is very important to us and we value your feedback. By telling us what you liked about your stay and how we can improve, you are helping us deliver a superior experience for you and other guests in the future. We hope you will come back and see us again soon. If I can be of assistance in the future, please don't hesitate to contact me at (503) 397-3000. Thank you again for taking the time to complete the survey. We appreciate your loyalty to our brand. We needed a place for one night in St Helen's. This hotel was clean, the service was good, the breakfast above standard and the room clean and huge! We would recommend and stay agin if we were in the area. Thank you for the great review. If you are ever in this area again please dont hesitate to call us for your lodging needs. 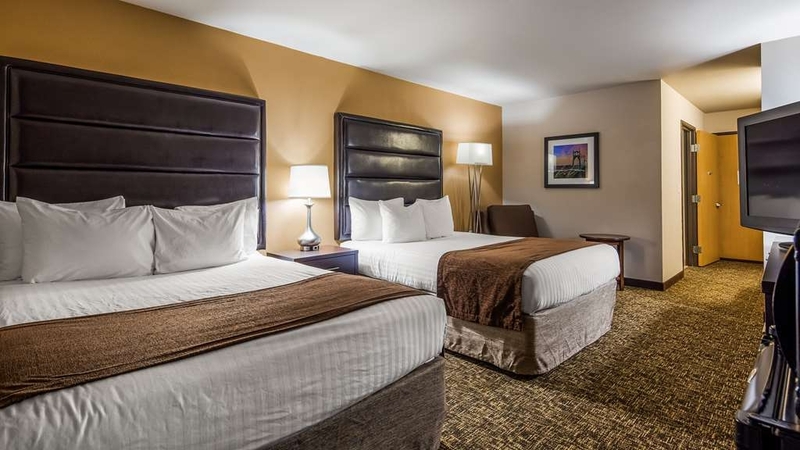 Your reviews make us a better Best Western and for that we appreciate you taking out the time to do so. 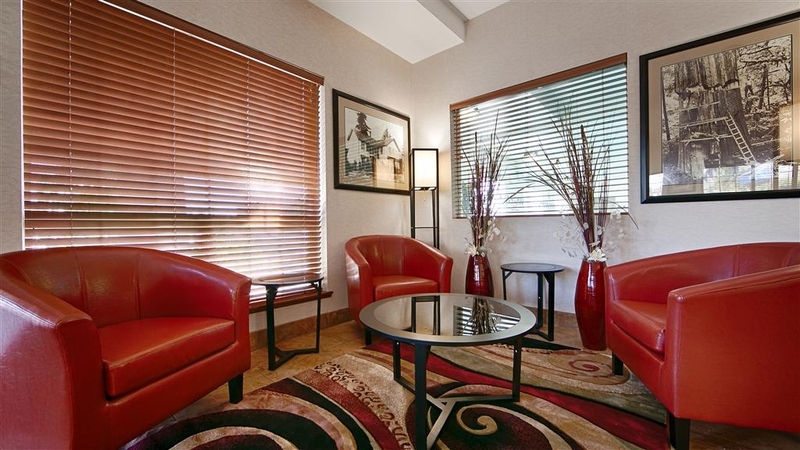 "Staff very friendly and helpful"
Upon arriving the front desk personnel was GREAT! I think her name was Kelly - she was so pleasant and helpful. The place was clean, comfortable and way above most Best Western's. Keep up the great work - we would stay here again!!! Perfect place to stay while attending a Northwest Motorcycle School course at Trojan Park. Called directly for the best price. Room was better than expected. Hot breakfast everyday was convenient and very good! Looked at B & Bs but this was a much better choice for location and amenities. Great value for the money. Would definitely recommend this hotel to others. "Very nice facility at very reasonable price"
Service was excellent, facility and room were clean and fresh and breakfast was good. A little hard to find even though right on main Hwy 30. The BW sign was small and unlit, but it is well worth the effort. "Nicely remodeled and very good staff"
Obviously remodeled and done nicely. No elevator but the front desk people were more than willing to help cart stuff to the room. General Manager - Anna - very nice, very good; front desk staff - Tristin and Kelly - very nice, helpful, and willing to help in any way they can; cleaning crew did a good job every day. Breakfast nice, well laid out, good choices though need to stock up on gluten free things. Available and enough parking. Nice hotel and amenities. Helpful staff, very good (free!) breakfast and cookies in the evening, about as comfortable as we could be away from home. I wish we could have used the indoor pool and spa. I really appreciated having a couch in our king room. Best Western is the best! Highest recommendation, no problems, excellent service, excellent breakfast. I will definitely be using Best Western again in the future. Clean facility, friendly happy staff. Everyone and everything was perfect couldnt have asked for a better night. Kelly at the front desk during check in is the sweetest lady i have ever met and she really does know how to do her job. The room was very clean and well maintained. Hotel upgraded my queen room to a king suite when I told them we were in town to get married. Then they decorated the room! Very nice room. Quiet. Roomy. And super clean. Super comfy bed. Highly recommend this motel!! "Generous breakfast, Accomodating, Helpful Staff"
We arrived around noon and they let us check in early. We reported the safety door lock missing and immediately sent a technician to replace and fix it. On a Sunday, it's a thumb up! Breakfast was awesome, lots of variety to choose and I was able to bring a "room service" to my husband since he's been working on his computer. It was a hectic Monday morning in his company, he was on the phone constantly and didn't think he could get off the conference call in time for check out. The hotel front desk let us check out late for no extra charge. Being the "only game in town" they didn't have to be so generous but they were. We had a pleasant experience at Oak Meadows in St Helens, OR with the exception that the ice machine was out of order and apparently had been for a while? (Laminated printed sign) Becky in particular was very upbeat and helpful! Im so sorry for the issues you had with your stay. Thank you so much for bringing it to my attention so we can remedy the situation. I would like to take this time to apologize. This Best western is in the process of being remodeled if you are in the area again we would love for you to give us another try. 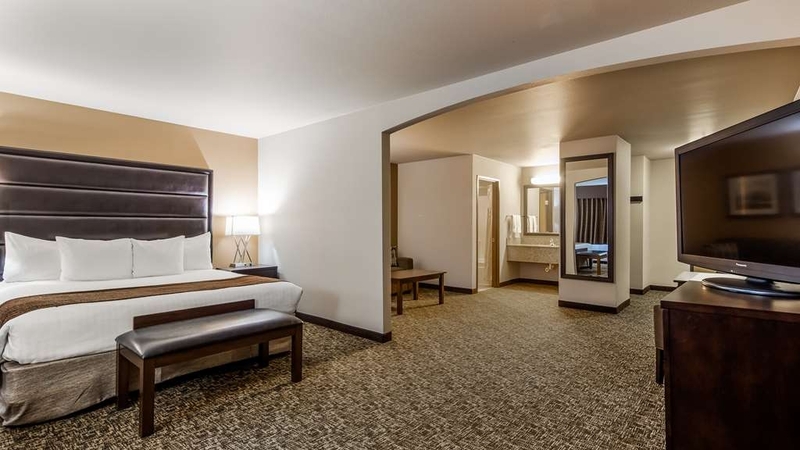 We need feedback like your to make this the best Best Western. Thank you for your time. Thank you so much for giving us such a nice review it is greatly appreciated. This Best western is in the process of being remodeled, if you are in the area again we would love for you to give us a try again. Thank you for your review it helps us make this a better Best Western. Overall room clean.. stayed on main floor.. Toilet very low... Recliner needs to be replaced... Other than that no complaints. Hard to see entrance from street. Could use some lights at entrance to help see it..
nice hotel, love to enjoy the swimming pool and hot tub when we are there.... we stayed at this hotel last year also when we boated up river as a Christmas ship. We will probably continue to do this each year during our voyage. It is nice that we can take our dog. This hotel is the best choice in the area. Very few options. The staff is friendly and helpful. Beds are comfortable. The lobby is small, and the public computer was monopolized by a strange woman and her son, for all of our stay. Don't know if she was staff, or guest. The pool wasn't heated, in need of a part; and the hot tub was hot, but no jets. They are pet-friendly, and had a nice grassy area for dog walking. We stay here every time we are in St. Helens visiting family. My family and I had a great stay at this hotel. Staff was great. Bed was comfy and the room was a lot larger then expected. Along with noticing that the maid staff truly cleaned the rooms and didn't just change linins and vacuum like a lot of hotels. Very impressed. We took our grandkids to visit Halloween town . We had a great time despite the extreme weather. The haunted house was great and the car show was awesome. The kiddos had a great time and want to return next year. Thank you so much for giving us such a nice review it is greatly appreciated. This Best western has started to be remodeled, so if you are in the area again we would love for you to come back and stay with us again. Thank you for your review it helps us make this a better Best Western. "Incredible team work does pay off!" We'd come down to see your two grandsons playing football game at st. Helens High School. We we decided to stay over an extra day and visit Halloweentown in downtown Saint Helens. The extra day turned out to be a very busy one for the hotel staff as I am told they had 70 checkouts that day. What we witnessed as we were going in and out almost seemed as if it was choreographed as well as some of the flash mobs in Halloweentown. It was quite impressive see people smiling as they did their job interacting with each other and the clientele of the hotel. Very comfortable beds very quiet rooms and a very clean atmosphere made for a wonderful stay. We would highly recommend this hotel even if you had business to do in Portland. We actually cannot wait to go back. The staff is extremely friendly and always smiling. Very patience and honored all of our special requests! The hotel has an indoor pool and spa. Which i didnt know when I booked the room, but was a major plus! 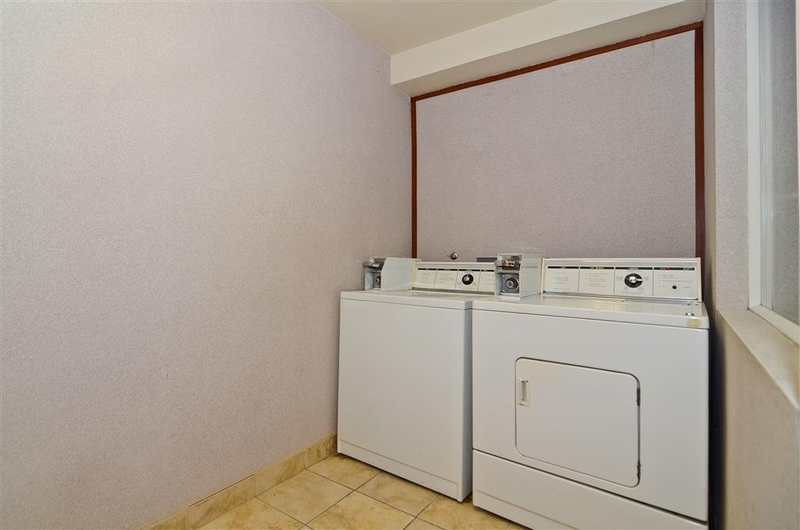 It has a guest laundry facility. Nice to go home with clean dry clothes. The breakfast was a full breakfast...sausage, bacon, eggs, soy milk, juices, coffee, etc and...pumpkin spice waffles. Those were actually good!! We had an unfortunate event and the staff was able to assist us and laugh about it later. Awesome! 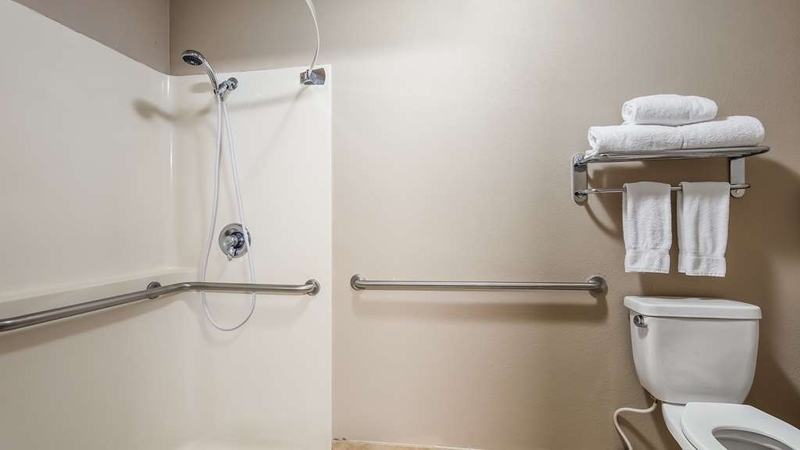 "One of the worst experiences we've had at a hotel"
I made reservations 2 months in advance and we did not receive a handicapped room, my grandson had to sleep on the floor because they gave the rollaway bed to another guest and there was a lot of mold. "Very clean. Brand new rooms. Friendly staff." I was very impressed with the quality of the room with the amount we paid. Very clean and brand new. So much so that it still smelled like paint! Every staff member we encountered was very friendly and willing to see if you needed any help. I highly recommend this hotel. "Best Hotel in the St Helens area!" Good clean hotel if you are traveling to this area! The rooms are clean, beds are comfortable. Hotel is back away from the highway which helps keep rooms quiet during rest! My favorite place to stay when I am in the area. 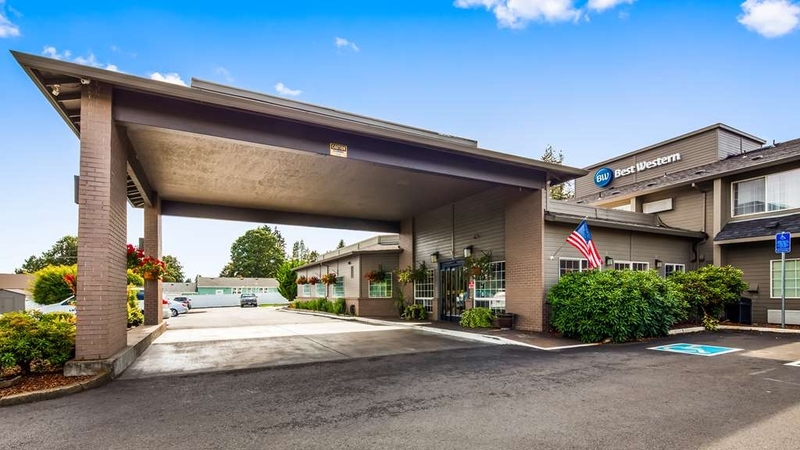 "Best Western Oak Meadows, St. Helens, Oregon"
This hotel is very convenient and comfortable for my regular business trips to St. Helens, Oregon. It is also very good value for me. I understand that the property is undergoing renovation, and I believe that I have yet to see a renovated room. The room I stayed in was a bit tired, and the carpeting had several stains, possibly from pets. It should be replaced. Also, the ice machine was out of order for two straight days. Otherwise, a good stay. There is not much to choose from in this area so I'm glad a read the reviewed and chose this place. Our room was large and comfortable. My husband especially loved the recliner. The motel is a 70-ish build but has been refurbished with the exception of the hallway which needs a new rug. We were in the area for a family get-together and would stay here again. The staff of this hotel is friendly and professional. However the hotel itself is horrible. It's duty and don't have even an elevator. Internet service in the room never work. If you are asking yourself why I stayed there? No other choice. The only hotel in twon. "Good value and friendly service"
First day maid told us she was done for the day and would definitely clean the room tomorrow. Next the maid cleaned the bathroom but a note was left on the beds stating that because "personal Items" were left on the bed the hotel policy was not to touch the beds. The items were two pillows and a book. Really? That still shouldn't excuse her from throwing away the empty coffee cups or vacuuming the room floor. "A great place to rest and refuel!" The beds were awesome and breakfast was amazing with biscuits, waffles, fruit, cereal...something for everyone. And the staff was truly great, kind and helpful. I would not hesitate to stay here again. Enjoyed my stay. Except one thing. No functioning alarm clock in my room. Some of us don't hear all that well. Luckily the phone has a blinking red light when phone rings. , otherwise I would have over slept. Staff on checkin exceptional. However,,, check out at 0500 in the morning wasn't as fast as most BestWesterns. Usually your bill statement is already slipped underneath door of room upon wake up. Overall a quite stay an peaceful. Recommend that they invest in up dating alarm clocks in all rooms. Phone ringer isn't very loud. "Nice Option Outside of Portland"
Usually stay in Portland but decided to avoid city this time and was pleasantly surprised by Best Western. Friendly staff, large room and good breakfast buffet. Location is set back from road so pretty quiet. All in all a nice option. "A mom, two girls and a dog..."
Where the amenities were not the newest, the hotel was clean, comfortable and felt safe and the rooms are quite spacious -- this was so very helpful; the staff was remarkable and "made our stay"; they were all helpful, made us feel welcome, attended to our requests/needs in an exceptional manner that exceeded my expectations; this hotel is great for "families on the road" -- but also the hotel was surprisingly quiet during the night -- we heard no one else unless we were in the hallways. This is really the only place to stay in Saint Helens, Oregon. That being said they could really gorge people on price, but don't. It isn't a new hotel, but well kept and staff friendly. We stay each time we visit our daughter and her family there. "Great breakfast, quiet A/C, and quiet room"
Terrific stay. Very quiet room on second floor with a newer A/C unit that was nice and cool and very quiet. Breakfast was great: the woman preparing it was very nice, the selections were great with bacon, delicious potatoes, scrambled eggs, nice yogurt selection, juice, and good coffee. One of the better Best Western hotels we have stayed in, and after a long drive from Salem, OR viewing the total eclipse. And a good rate for the night considering the demand. The only negative was rather dirty carpets in the hallways. Hotel is very nice overall. Only issue was the hotel billed my credit card (pending) 16 hours prior to my check in. I do NOT like this policy. Don't know if this is S.O.P. for all hotels, but I for one find it inappropriate use of my credit card. Because of this policy, I will look at other hotel chains in the future. If you don't mind this type of billing policy, then you will enjoy this hotel. This was my hometown for 35 plus years. Returned for pleasure. Wonderfully surprised at the appearance of grounds, building and staff friendliness. Marvelous changes. Gluten free, so did not expect much at breakfast. However, even this was good. Thank you for your positive review of our hotel. we are so glad to hear you enjoyed the breakfast options we had to offer. We hope to see you again in the near future. Thank you for your review of our hotel, We appreciate the feedback and hope that you will consider staying with us in the future. "Oak Meadows Inn, Saint Helens"
A very good place to spend the night when travelling a long distance for a family get-together. The Inn is centrally located in Saint Helens. It is set back from the highway enough to be easy to get to and yet buffered from the road noise. The staff was friendly and helpful but the facility was marginal. Although it is clean the walls are paper thin. When we arrived there was a huge multi-generational family reunion going on. We had booked through Expedia and thus the front desk would not move us to a quieter room. Our room was directly across from the party. There was a family with kids directly above us too. Lots of thundering footsteps until late at night. It wasn't only noisy but the bed shook! Might have been fine if not for the thunderous party! Found myself needing to stay locally on a late Sunday night. Thank goodness for the wonderful room. Wish the cable Tv was better and channels more abundant but quiet and clean...that worked for us! Have stayed here several times before, glad we could bring our dog as well. "Swimming pool chemical were too strong!" Wanted to spend special time with 7 year old grandson. Selected this hotel for the indoor pool. He developed a painful rash while swimming. We couldn't use the pool from then on. The manager was rude when I bought the issue to her attention. I asked for an adjustment on my bill. She smirked about my complaint. We did not get any a adjustment on the charges, I said my review would not be positive, she said while you just do that! Two hours later I got a phone call from the nice desk clerk, she said they tested the pool and the Ph was wrong. She said the manager took $25.00 off the bill. Kim apologized profusely. Not much of a refund for an entire day not being able to use the pool! "Don't Judge the Book by its cover - Very Nice, Very Clean, Everything Works"
Rm 204 - top of the stairs, queen bed room. No elevator (this is why they don't have 5 stars). Older hotel, but it is not worn or threadbare, or need of maintenance. Clean, everything works and the staff is super, super friendly and professional. I rolled in sick and was not the nicest person. They were accommodating, but not pushovers (I like that - it keeps them from being bullied by people looking to get something for nothing). In that state I nitpick EVERYTHING. I have traveled for work for over a decade and have seen the hotel chains rise and fall. Best Western in on the RISE. I have found the rare exception to that and report accordingly, but the Oak Meadows Inn falls in the the GREAT category. Breakfast was out on time, hot and fresh, everything is clean (and I have a hard spot for clean eating areas). Everything in the room works, the refrigerator was clean (and this is not the norm in most hotels except BW). 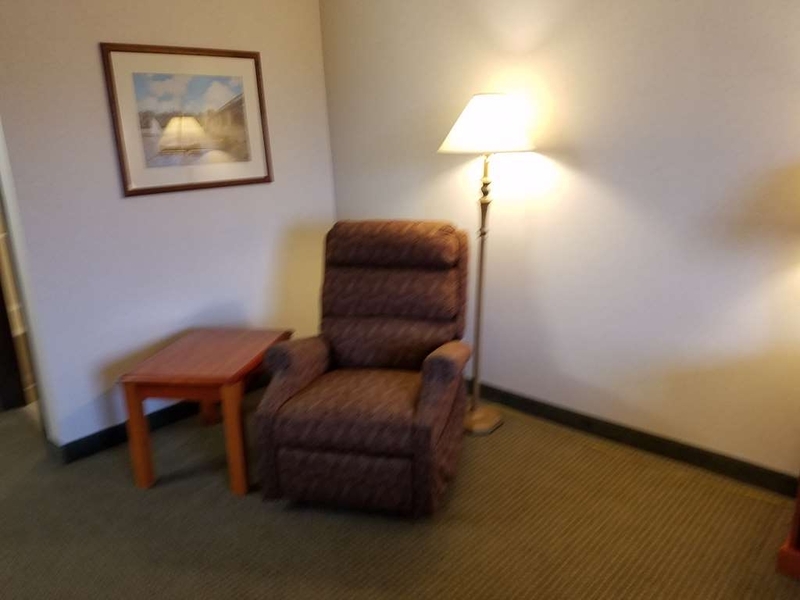 This room has a LOUNGE CHAIR. This is my home away from home when I come back here on business. Great TV channel selections, reasonable internet (not business fast, but most here are not on business). This is a pet-friendly hotel. I travel with my dog on occasion and keep track of the truly pet-friendly properties. However, the rooms do not stink of animal. I cannot report on the pool or the local amenities. I'm here for work and will not do much sightseeing this trip. 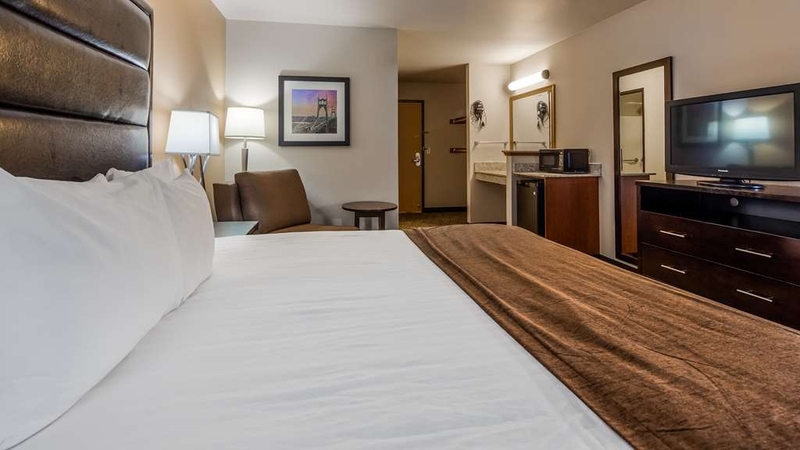 "Relaxing location near Portland Oregon"
This hotel is a great place for the cost and for its location. We stayed here while visiting family who live in the Portland area. It's located just north of Portland Oregon, in a nice rural area. The cost is very reasonable for a clean, large, and comfortable room. They also had a nice breakfast - eggs, sausage, waffles, etc. I would definitely go back when visiting family here in the future! "Great staff nice clean hotel." Enjoyed our stay. We stayed there for one night. The room was very clean with a comfortable bed. My three year granddaughter enjoyed the pool. It was clean and not over crowded. I felt the price was a little high for the area. The staff was very friendly and helpful. I would stay there again. Our reservations were not what we arranged. Hotel was sold out and not a lot of offer to help. No fire alarms in the rooms only in hallway, staff had to knock on doors, not a great system if there had been a serious fire. We were evacuated for a fire next door (not hotel's fault), but staff didn't know how to turn off alarms so we waited outside way longer than necessary. A manager did not respond. "Worst Hotel this side of the Columbia!" Filthy rooms, filthy bathrooms, clock alarm set to SCREECH at 4 a.m. It was 100 degrees outside and our first room did not have a working air conditioner. Our second room was the most unclean place I had ever stayed. We had to keep our shoes on. Hair and dirt on shower walls and floor. Dirt and hair still on floor, untouched AFTER housekeeping came in to clean because of my complaining. Reduced fee upon checking out was an insult as it was not worth $100/night. It was simply gross. The carpet had huge wet stains of some sort that were still there upon our leaving. We had no choice but stuck it out the two nights. I'd rather pitch a tent then stay at this Best Western ever again! "Good value .. Nice hotel"
The Best Western in Saint Helens is a nice hotel - Staff is friendly, hotel is clean and quiet. They also offer a nice breakfast in the morning. I would recommend ... It is a great hotel option if you are planning on staying in the Saint Helens area. I can't say enough good about the friendly service at this Best Western! Forgive me if my 5-star rating suggests a Four Seasons or Ritz Carlton; it's not that kind of place. But rooms are clean and comfy, breakfast is good, and the staff is superb. In particular, if you travel with your pet, these folks are over the top pet friendly. This morning, I needed to be away from the hotel for several hours. Originally, I planned to take my dog with me, and leave her in the car, with a shade cloth over it. However, that was before I knew that today's temps would be in the upper 80s to mid 90s. Because of the heat, I decided to leave her at the hotel. When I stopped by the front desk to explain that I planned to leave here there, unattended, I expected resistance from the manager on duty. Instead, she wholeheartedly agreed with what I was doing and her only concern was that housekeeping not enter my room while my dog was there without me. Since I had already coordinated timing to have my room cleaned, this wasn't a problem. I'll definitely stay here any time I'm in the area -- with or without a pooch. "Best of the Two Hotels in Town"
We've been staying here for approximately 3 years when we visit family. 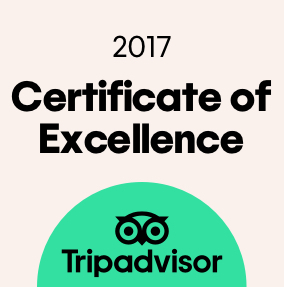 We've had excellent experiences for the most part. A few times the pool/hot tub was not working so if this is important I'd suggest asking at booking. Staff is very friendly. Good selection at breakfast. Upon arrival was told that room did not have hot water available, but other rooms in the hotel might. Hotel did not offer to move me to a room with hot water nor did they offer any reduction in the room rate to compensate for lack of hot water. Hot water was available in the morning, but really needed a shower when I check in the day before. We have visited family in the St. Helens area for years and everytime we stay at Oak Meadows. 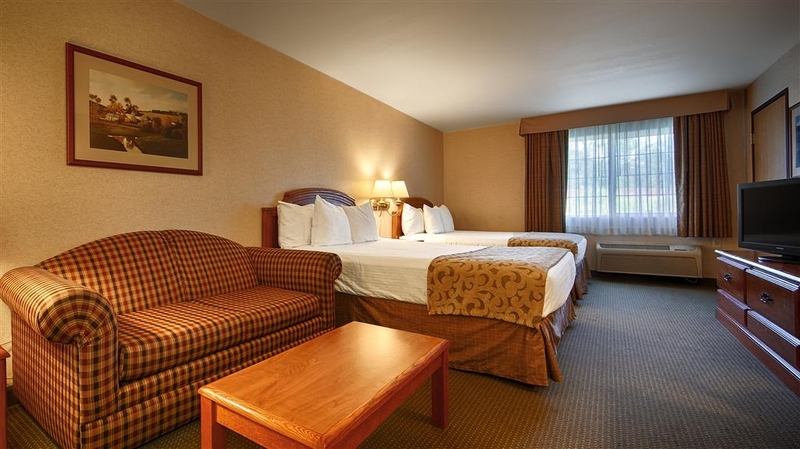 Nice to know we can count on a consistently friendly staff, clean and comfortable rooms and an overall great facility! My husband and I like to get away for our anniversary. We go to our local hotel, The Best Western in Saint Helens. The staff is the best making our stay even better. The pool and hot tub are the main reason we go. Breakfast taste great and the room is a great price. The staff was able to change rooms easily because the first one had a strong cleaning smell. There was warm cookies at check in. They still haven't fixed the back door lock that is broken from two weeks ago. We stayed two nights and also used the conference room for a 50th birthday party (about 50 ppl). The staff were all very helpful and accommodating- always eager to help or answer any questions we had. The room was clean and comfortable. Too many things broken or out of order, no elevator, they put kids on the top floor and old people on the bottom floor, did not fix anything or show concern for the broken fan/heater in room, the hot tub was out of order, not a good place for families with children to stay. It did feel safe and was very clean, and the breakfast has been good every time I have stayed there. But not worth it being so overpriced and unaccomadating. Over all this is a diamond in the rough, staff very friendly and so willing to help. rooms are always clean and comfortable. Some times the hot tube is out of order and my wife doesn't like it, so with wife unhappy no one is happy. but if you are just looking for a good night rest this is the place, Oh breakfast is good always hot but the trash cans need to be bigger so your hands and fingers do have to touch the lid. We were delighted to be enthusiastically and warmly greeted upon our arrival as walk ins for one evenings stay. Kelly made us really feel that she was glad we were there and not simply an inconvience (as other establishments have in our experience) to serve. She was able to accomodate our request for a ground floor, explained the amenities and was genuinely nice! The room was clean, roomy and we were happy to have a chair to sit on to watch TV. The Bed was comphy and the a/c worked great! Neither of us noticed any road noise as the motel sit back from the road. Always try to stay at a Best Western Plus....This was comfortable but a little on the shabby side...had free internet, frig and comfortable bed. The breakfast was a full breakfast. Staff was very nice. We've stayed at this location numerous times. It is the the most appealing hotel in St Helens. In my humble opinion it is a little overpriced for the location. Breakfast is generally good. Bed is very comfortable. When you consider this property asked for a room away from the stairwell. There is no elevator to the second floor. It was a nice clean place, food was good, staff was good and the general manager upon check out noticed a pricing error and fixed it promptly. That lower my bill. The room was clean, we would stay here again if needed. 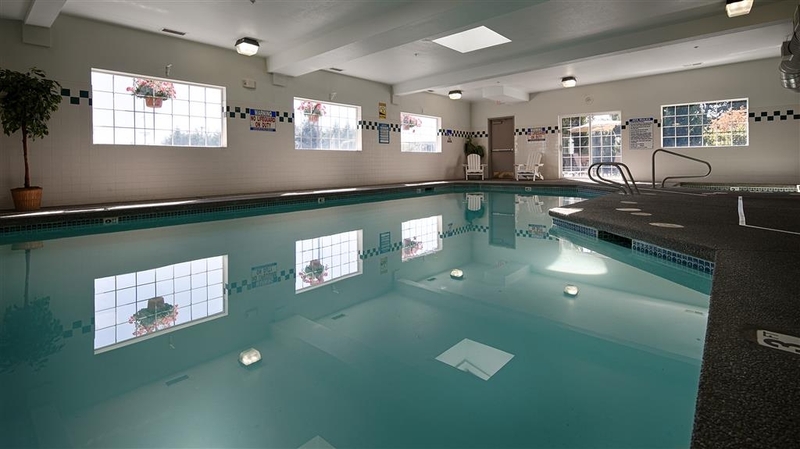 "great indoor pool and a good full breakfast!" We were traveling in winter weather with young grandchildren and found the Oak Meadows Inn Best Western Motel to be a bright spot for us all. The room was good sized and the indoor heated pool was just the ticket! There's also a hot tub. The continental breakfast was really a complete breakfast and the staff was particularly helpful. Jordan at the front desk kindly provided a toothbrush to me when I discovered I had forgotten mine. He also answered questions and gave me good info on things to do in the area. "Good Hotel for the area"
Nice hotel. No elevator, very odd but ok. Made second floor trip up stairs with luggage difficult. Room was very spacious. Good bed. Had no troubles. Great breakfast, had everything you expect. Would stay again if in the area. This hotel is tucked away in a beautiful bedroom town near Portland. It has easy access and plenty of parking. The breakfast was really good and the staff very pleasant and accommodating. I would stay there again for sure. Room clean and well ventilated. All amenities in place. Munchkin-sized toilet leaked/repaired immediately. Amazed to see that breakfast bar was fully stocked and staffed. This was the first time I have ever had this experience. A very special thank you to the lady in charge of the breakfast bar. FINALLY, some one who cares. The hotel looks really nice from the street... and the lobby is okay. The rooms are old and outdated. Our room smelled as though someone had thrown up in it recently. Unfortunately this is a small town, and not a lot of choices of places to stay. We were there for an event being held in St. Helens. Not being from the area, we did not know how far it was to other possibly better lodging. 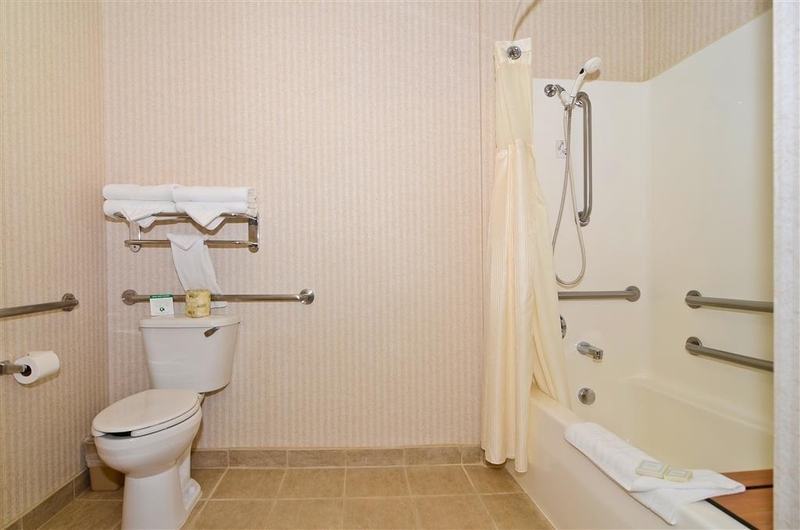 Unfortunately, I have come to find that it is hard to depend on the quality of Best Western hotels. Booked a night in two rooms for my visit to Halloweentown in the sleepy town of Oregon. The two rooms we were given both smelled, one of smoke and must, the other one of vomit. The blankets between the two flat sheets were stained brown on the corners and discolored along the edges but I guess you can't expect much from a Best Western. The jacuzzi was out of service but the pool was open where I stepped on a earring. Kelly was rude and unhelpful and tried to defend the cleanliness of their pool but said they weren't responsible for what was dropped inside the pool, but didn't have an answer when I informed her I got injured walking alongside it. The pool was not maintained or swept daily like promised because my husband found the matching earring along with a 3-4" screw a few feet away from it. When checking out they promised to pay for any other medical bills and to comp both room but I haven't heard from Nonie (the gm) and only got the answer after speaking to customer care 3 days later. They went back on their word and refunded only one of the two rooms, even though I have printed receipts saying both rooms would be refunded. This will be my first and last stay at any best western and will be sure to tell everyone about the horrible customer service in addition to their dangerous and disgusting accommodations. "A surprise in St Helens"
We spent the night in St Helens while visiting friends. Our preferred lodging when traveling is our motorhome. but this time we opted for a motel along the main highway. What a pleasant surprise we found in this small community motel-very friendly staff, a clean and nicely decorated room (looked almost new), comfortable bed/linens, and a large and well displayed breakfast buffet. 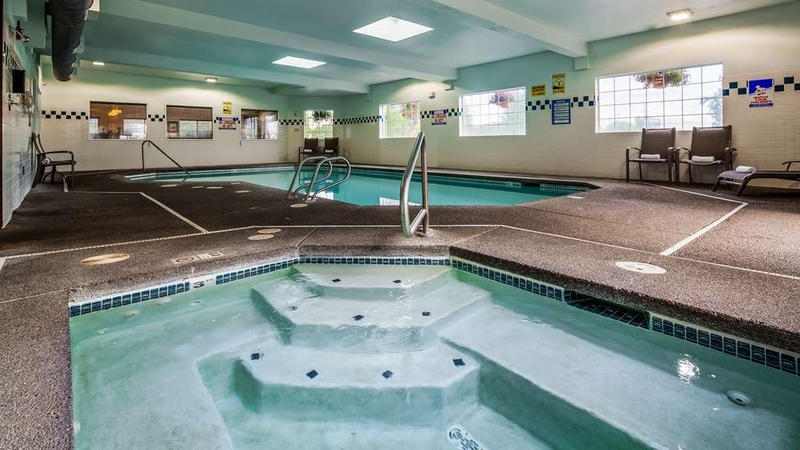 The motel also has an indoor pool which we didn't use but looked inviting. We would definitely recommend this motel to others and use it again if in the area. "The Staff at this Hotel Made feel Right at Home"
This is a good hotel for the area, Usually very clean but there has been a few times we stead here and found the chair and the couch with dirty arms rest, kind of a turn off, but here's been more times the rooms are very clean that's why we stay here so much plus it's close to our grand kids and they like the pool. The breakfast is good, it's always the same thing so if you stay for a few days you may get tired of it. The night employees are the best always friendly but sometimes the morning help seems that they are just glad to see you go. My room was big, quiet and comfortable. My only complaint was my coffee maker had a defect but it was workable, I had more decaf then regular in my room when I got there and the maid service was a little sub par. (didn't clean the coffeemaker) I guess coffee is a little important to me. Everything else was really great! I would gladly stay here again, it's the nicest place to stay in St. Helens for a reasonable price. Thank you for staying with us it was our pleasure to provide excellent service, I am very sorry about your coffee I know how important that is. 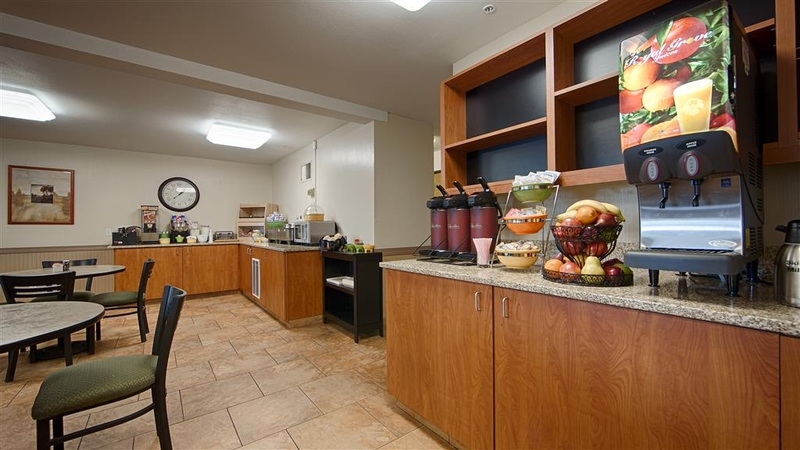 Take away the spectacular breakfast, the surgically hygienic swimming area, and warm cookies upon evening return - and you still have yourself a comfortable, quiet hotel with an extremely staff, and enough within walking distance to satisfy any business traveler's needs. You'll enjoy the wide sidewalks for your morning/evening walk or jog. The room was decent, the breakfast had all of the usual characters (eggs, waffles, cereal, etc.) and was kept clean and well-stocked, and the staff was all nice and very helpful. No gym, but it does have a pool and hot tub. Have not stayed here since 2012, although we had many nights here prior to that. The propriety is the same, but staff has changed (new owners. perhaps?) Prices have gone up considerably from 4 years ago, but the value is about the same. Probably the best motel on the Oregon side of the Columbia, between Portland and Astoria. we stay at this Motel a lot. We find it always welcoming and clean their hot breakfast is not to bad. Staff always friendly the grounds are always very clean and manicured nicely. You will not be disappointed. The Best Western, St Helens, OR is a consistent value. In the last three years I visited 8 times. 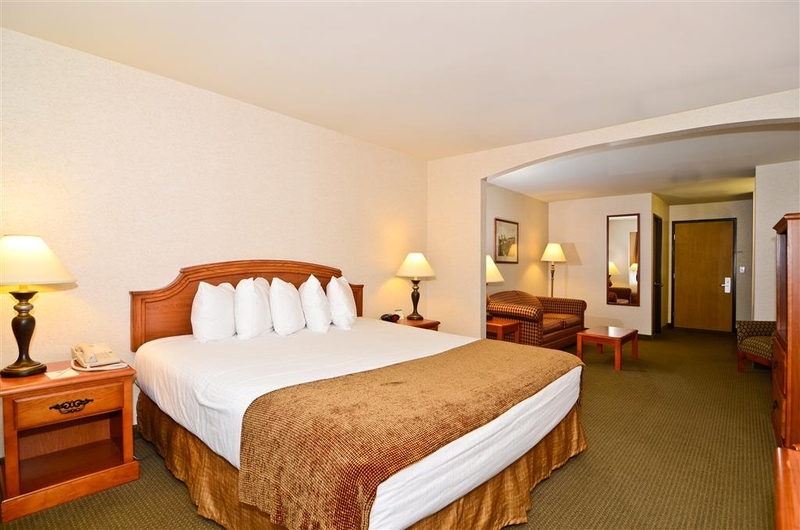 The hotel offers clean, comfortable accommodations at a very affordable rate. Very nice breakfast in the morning and the staff is always willing to help with any needs. This is the place to stay in the area. This hotel was very clean, the people were friendly and helpful. The room was comfortable, and relaxing. Pool water was warm and the hot tub was wonderful. My only complaint being there was a group of kids running through the halls at midnight. Other than that I didn't have any real issues. I will definitely stay again, hopefully soon. Friendly and helpful staff. Room was clean, spacious and quite comfortable. Breakfast was great. Varied selection of hot and cold choices with something for everyone. Will definitely stay again. No elevator, but that was not an issue for our stay. Spent three days is this area for kayaking and sightseeing. Close enough to portland to drive into town for a day there. Very friendly staff. No elvator but there are only about 10 steps to get to 2nd floor. Parking is ample. Our room was quite large, even with four people in it. So that says a lot! "beware of undisclosed cancellation policy"
I made a reservation for 2 rooms very early in the year for the weekend of the Seattle to Portland bike ride. In March, my credit card expired and was replaced by another one (same number, new exp. date of 2020). I received a confirmation email from the hotel during the week prior to the reservation. When we arrived at the hotel at after 10pm at night, having ridden our bikes 175 miles to get there, we were told the reservation was automatically cancelled that morning because of the expired credit card. Can you imagine having biked 175 miles in a day only to be told you have no place to sleep when you intentionally made the reservation 6 months prior to the event? Fortunately for us we were able to get one room which we all shared, sleeping on the floor, because someone else had also made a reservation with a card that had subsequently expired. We happened to show up first, so we got the only room left within a 50 miles radius. Unbelievably stupid cancellation policy. Seems if you can generate an email confirming your upcoming reservation you could just as easily generate an email requesting an updated card OR better yet, let the person who made the reservation present the valid card upon arrival. Very disappointed in this lack of consideration. We just stayed here one day to be close to the airport form our trip to MT Rainier National park, boy what a way to end the trip. this place gave you outstanding service in every department the rooms were clean and the bed was comfortable, the ladies at the front desk were always helpful and cheerful no matter what time of day you got there! the housekeeper gals also did a wonderful job and would greet you in hall in the morning! breakfast was hot good and very clean area! didn't have time to swim but the pool looked pretty good too! could not say one bad thing about this place! Nice hotel, check in took 2 minutes, met by friendly staff, room was impeccable, everything smelled fresh and looked new. The breakfast was incredible with fresh eggs, sausage, bacon and even a waffle station . "Friendly staff but poorly maintained"
We stayed here for one night on our way to the Oregon Coast. Luckily it was for only one night. The room was nice and big cuz we paid for an oversized room but the supplies in the room were lacking. 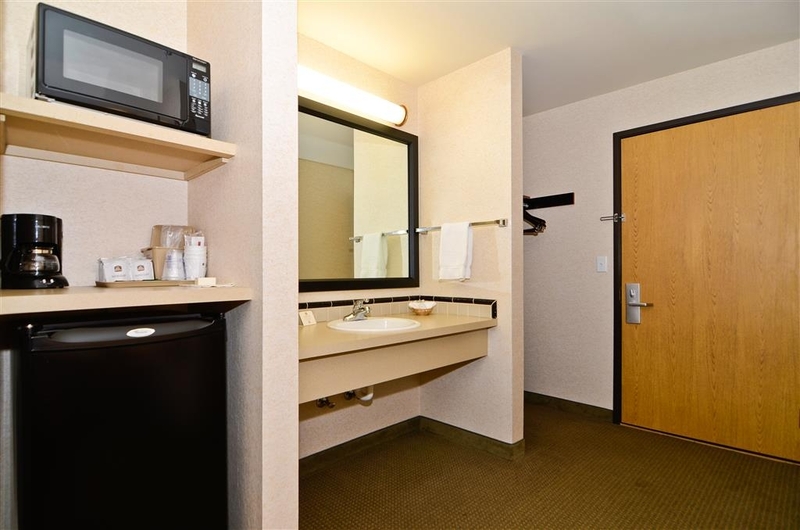 Not enough towels for the capacity of the room which was four of us and all the soap and shampoo dispensers were empty. The bathroom sink wouldn't drain and we had to plunge it ourselves. It still didn't drain properly. The breakfast was ok but the coffee was awful. Definitely not one of our better experiences at a BW. I stayed at this hotel as a last minute decision while attending a family funeral. The staff was very accommodating with room and rate. Clean, comfortable and reasonable rate. Room needed new carpeting--not dirty but worn and wrinkled. I loved that they allowed pets, though, and I may have had a pet-friendly room even though I didn't have my dog(s) with me. I WILL use them again if I return to the area, especially if I have my dogs. this is the best place to stay in St. Helens. If they improve the breakfast and internet consistency that would up my rating. The rooms could use an updating. The staff are great. There are no elevators to the 2nd floor so if you have issues with stairs, stay on the 1st floor. This is a wonderful and friendly place to stay. They allow pets and have a wonderful area to air them in. Hotel is nice looking and the staff are outstanding and always there to help. Dont like the smoking area right outside from entrance, though. Otherwise a great stay. Large, very clean rooms with nice bedding and comfortable beds. Pool area is bright and clean with a good jacuzzi with strong jets. Good hot breakfast and fruit set out on the counter for afternoon or evening snack. Check in was quick and easy. Forgot to ask about an elevator, but we'll stay here again and I'll remember to ask for a ground floor room. Received excellent service and great breakfast, Rooms are very clean. I would recommend to travels as I enjoyed the amenities. Easy walk to surrounding restaurants and coffee shops. Beautiful area with beautiful views. This is a great, clean, nice place to stay. The rooms are large and clean. The breakfast is nice - just plan around the other guest that might have small children running about. The pool is large and the spa is nice. We really enjoyed swimming and the spa before bed. The front desk recommended two restaurants and we made reservations and ate at both during our two nights stay. Both were amazing. One had a bleu cheese burger that was divine. The other was a pasta place with great service and food. WOW!! We will return to fish and stay at this hotel! "Great Value and you can Upgrade to a Suite for a Nominal Cost"
We stayed here last weekend and the bedding was very nice and the room was large. It had a separate sitting area and was well appointed. The hotel provided facial wipes, which was a nice touch. If you forgot your razor or toothbrush, they provide one for you. It is centrally located and provides a morning breakfast with bacon and sausage, which was pretty good as far as hotel breakfasts go. I would definitely stay again when in the area. 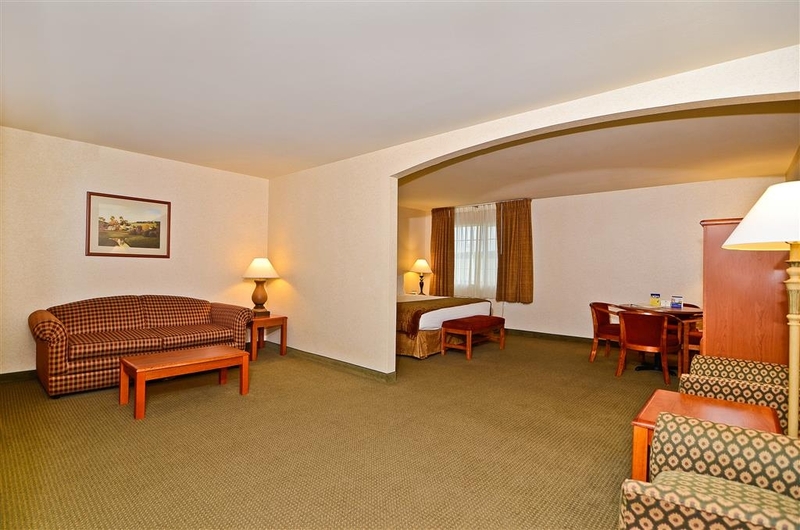 When we needed to stay in a hotel, we chose Best Western for their overall accommodations. Helpful staff and room comfort is the reason why. We've tried other hotels, but were overall pleased with BW. Some locations are better than others. Oak Meadows Inn in Saint Helens, OR is definitely one of the best! 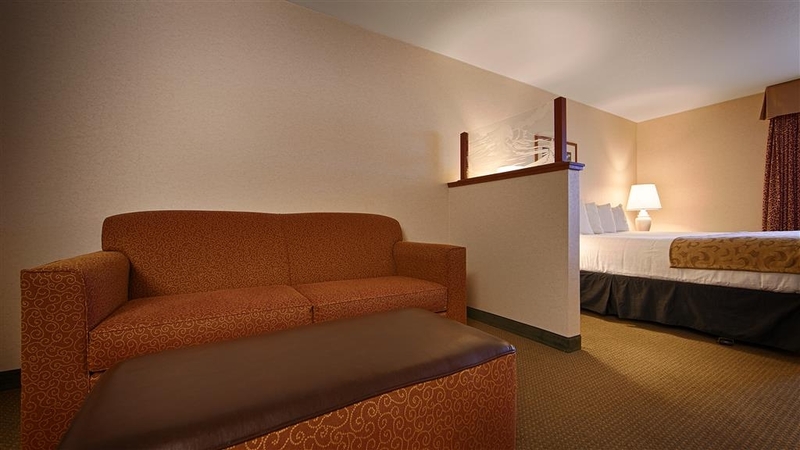 "Always a Pleasure to Stay at this Best Western"
Nice Rooms! Quiet except for a few rude guests. Great Location. Lots of food and stores nearby. Cookies in the evening. Great staff! No problems here! Highly recommend. We have stayed here several times and really liked it! This is a very nice hotel, an unexpected find in small-town St Helens. What a treat to have a really clean room, comfortable bed, truly hot water and great water pressure in the shower PLUS a bacon-and-egg breakfast! 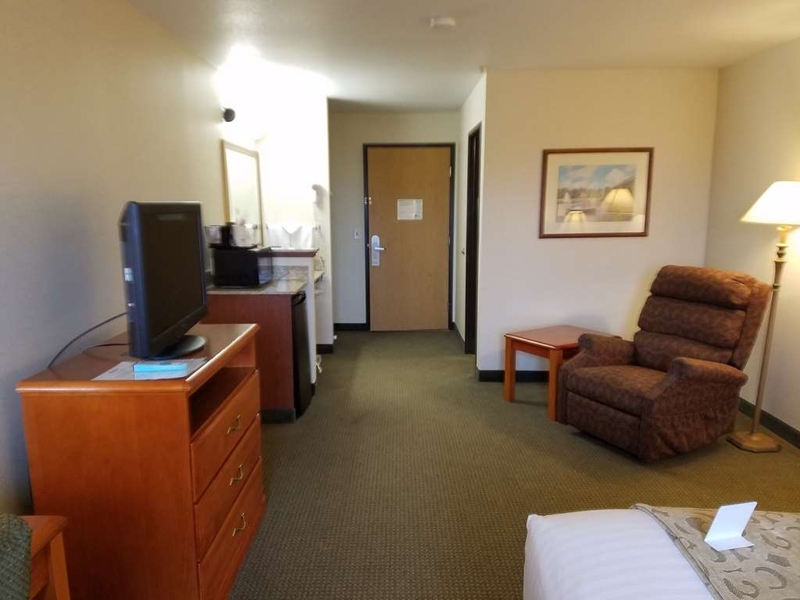 Very clean large rooms, good location, and I would have given it a 4 star rating if they would have made the wake up call that I requested the night before. We were late for our guided fishing trip in the morning. My advise is to double check your request !!!!! Spent 3 night at this motel. The room was clean and comfortable. The maid service was excellent every day the room was as clean as the first night. The desk staff was friendly and helpful. There is a pool and hot tub but we didn't take advantage of it. There was ample parking but only one access point from a busy street. It's far enough off the road that the street noise is no issue. I plan on staying here again next year. We have stayed here before and will stay again. Best there is! No hassle, just friendly people that care. Need a spoon when the breakfast area is closed? No problem, they'll get it for you. Need extra towels? Yep they'll get those to you pronto! "The BEST BEST Most Excellent Best Western!!!" I booked this hotel at the last minute and having driven by it for many years, was not even sure where it was!!! When I called to reconfirm my reservation, the front desk clerk, Samantha, was upbeat, joyful and welcoming. Upon check in Samantha was again upbeat and welcomed us. My grandson and I went to the room and his reaction was "WOW! Grandma, this is the best day of my life!! This 'house' is so nice!" (he is four and a half) The following morning we had a full, home cooked breakfast in their breakfast room overlooking the indoor swimming pool. We wished we had time for a swim - but alas, we were going to celebrate my mother in law's 100th birthday! When housekeeper, Natasha knocked on the room door a couple of minutes prior to us departing, I told her we would be out of the room and shared our purpose for staying at their hotel and complimented her on how nicely appointed and clean the room was. When I returned very late that night, I saw my grandson's bunny propped up on the pillows on one of the beds with a note that read "Dear Guest, Hope you are having a wonderful day in this beautiful sun. Happy 100th! ( - : . Enjoy your stay. H.K. Natasha" WHO does that? How touching and sweet!!! I would definitely stay at this hotel again - in fact, almost booked back in last night just to enjoy the excellent service! I am MOST impressed with the BEST WESTERN Oak Meadows Inn. 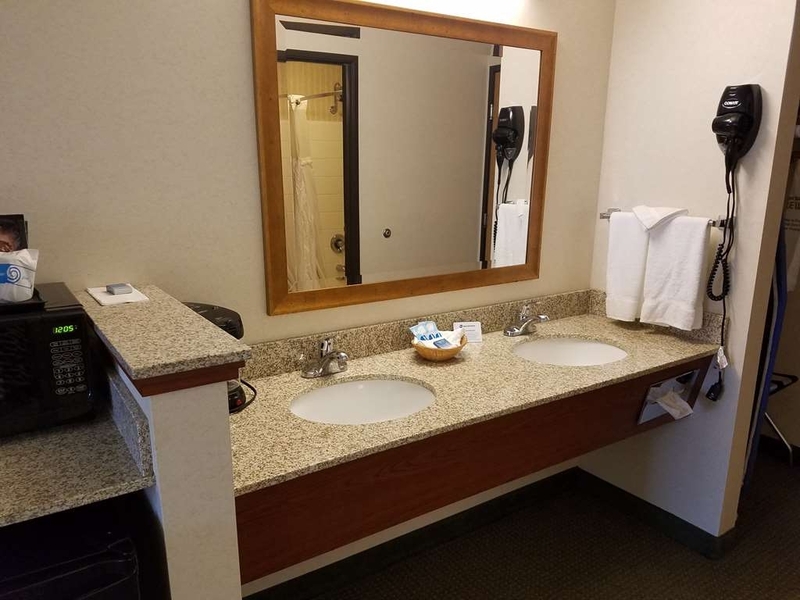 My husband and I have had occasions to utilize the services of Best Western Oak Meadows Inn in St. Helens a number of times. We have found the staff to be above reproach and the amenities and facilities clean and well serviced. They have gone "above and beyond" to make each stay a pleasure. 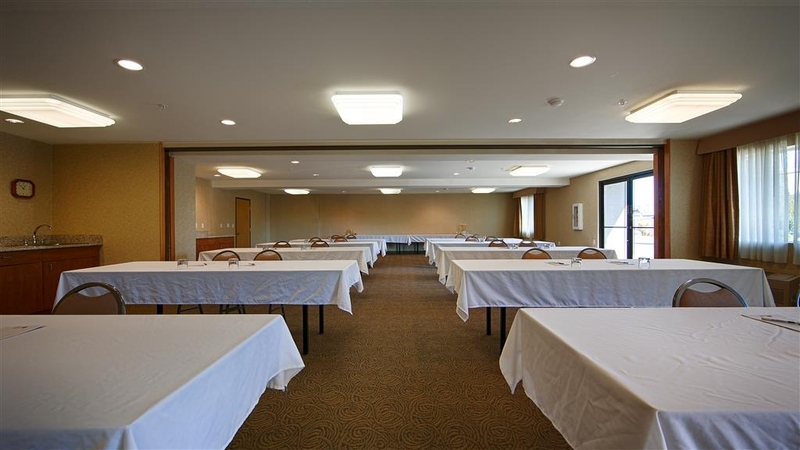 In fact, we utilized your meeting room for my mother-in-law's 90th birthday party, and secured rooms to accommodate the many out-of-town guests. I would highly recommend you! We originally booked a less expensive room in Keslo, WA but found the drive to St. Helens to be longer than we originally anticipated. This was a great location for visiting our family. We plan on making another trip and spending more days so we can go fishing there. It is a beautiful area. The hotel was very comfortable although it did not have an elevator. Granted it is only a two story hotel but with 2 little kids it made it hard to get luggage up carrying both kids each trip up and down. The pool and hot tub was nice and they had noodles (the floaty things), balls, and goggles for the kids to play with in the pool area. They had a good breakfast with waffles and strawberries and whipped cream; as well as biscuits, gravy, eggs, and sausage- which was nice. I would highly recommend this Hotel to everyone. Everything about this Hotel is top quality. The Staff goes above and beyond & very friendly. It is one of the best Hotels I have stayed in & I have stayed in a lot of Hotels. No one will be disappointed in there stay here. "Great Place to Stay Tucked back from HWY 30"
First class Hotel. Linda the Manager made our stay a wonderful experience! Breakfast way better than you would expect. Eggs, bacon, sausage, and waffles. And many more....items. Quiet, comfy beds, Nice pool and jacuzzi, all for a very fair price! One of the Best Best Westerns we have stayed at! Kudos to the crew at Oak Meadows! This motel is far enough off the highway that you hear absolutely no traffic noise and the queen beds are some of the most comfortable I've ever slept in. 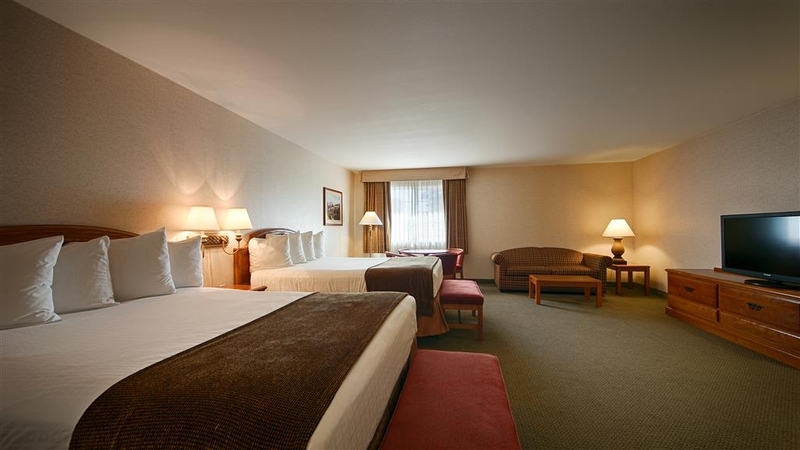 I am very impressed with the cleanliness of the room and how professional the staff is. Everyone I have talked to is nice! I am two weeks into a twelve week contract and am looking forward to the next ten weeks knowing that that they will take care of me. I have had to be at work too early to partake in the breakfast, but my husband says it's very good and I've been too tired to take advantage of the pool or spa, but they look well-maintained and I've seen many other people enjoying them. "Clean, comfortable, quiet, and efficient"
We wondered why this hotel got such high ratings, and now we know. It's a solidly built hotel, very quiet, with simple but high-quality features: Comfortable bed, great shower (good water pressure), microwave, spacious Whirlpool refrigerator. The room is well designed and well lit and everything — everything! — is impeccably clean. 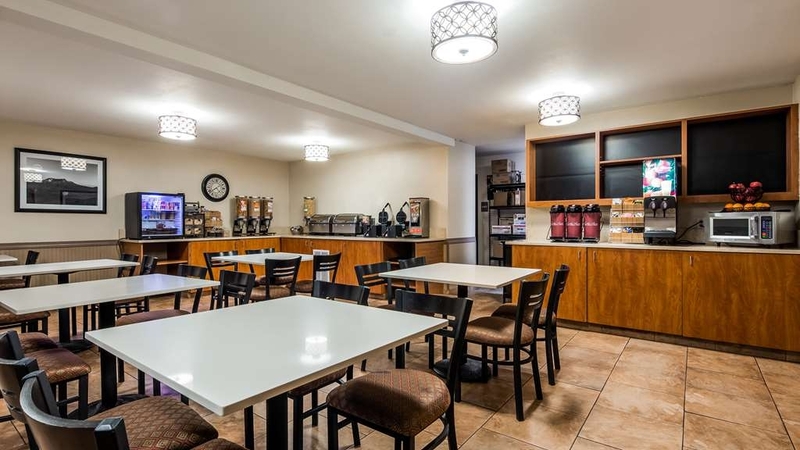 Plus they have friendly staff, a delicious breakfast buffet (eggs, sausage, bacon, waffles, biscuits and gravy), and round-the-clock coffee and tea in the lobby. The staff even helped us find a computer technology store. Top-rated! The Best Western Oak Meadows Inn was very much like most Best Westerns. It was clean and the staff was very friendly. It is located right on the Columbia River Hwy but we did not hear any traffic noise. The price was very reasonable and if we were to visit Saint Helens again we would stay here. My stay was very pleasant, nice hotel with extremely friendly staff. Bed was a little lumpy, sheets were luxurious and very clean and there were plenty of pillows. Room was quiet as requested despite large group of teens down the hall. Everything worked, breakfast was better than most. Will stay here again, no doubt. This was our 4th time staying at this hotel, again no complaints! One thing to note is there is no elevator so for someone with limited mobility it could be an issue. We were able to switch our room from king to double queen which was very helpful. The pool area is nice and we enjoyed the hot tub as well. Breakfast was good the next morning would have loved more fruit but all in all will definitely stay here again! 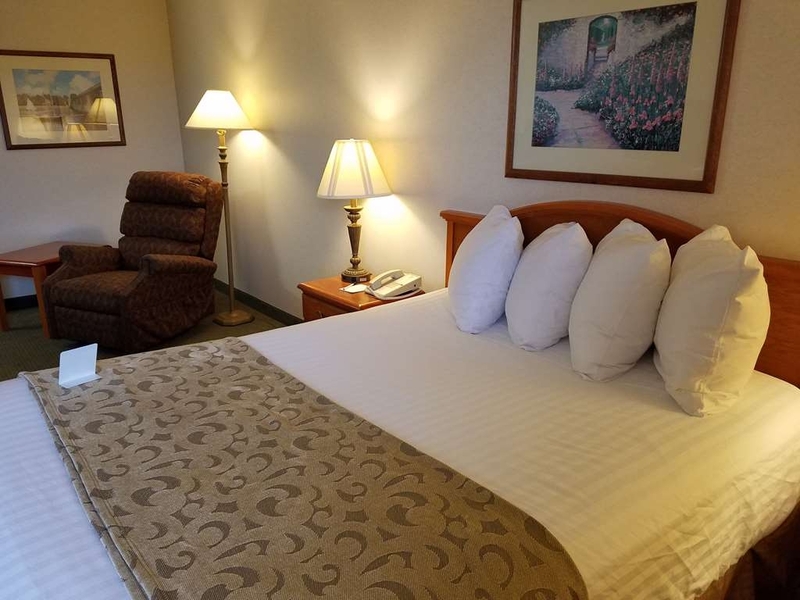 "Great value for motel stay"
This hotel has nicely redone amenities; fresh carpet and furniture and fabrics.. I'm pretty picky and I was pleasantly surprised. This is not a 5 star hotel but for a motel stay it was very clean with fresh new finishes. The staff was very friendly and the bed was very comfortable. We booked a large room early in the week for a few days, and the next day extended our stay for the entire week. We had to move out of our room by the end of the week which was a disappointment as the next available room was much smaller, but the staff took good care of us. We watched the staff go from tending to a small number of off-season guests to full capacity and troubled guests - the week that the landslides closed off Hwy 30 and I-5 - and the staff only got better, as they had to deal with packed rooms, fuller and extended breakfasts, and extra laundry. We considered a few other options in the area before we booked on the phone (bed and breakfast, RV park, other hotel) but I felt the safest at BWOM (weather and character) and was so thankful to be there. From Manager to maintence, this was a wonderful hotel experience. I rated sleep quality as 4, I think only because of the travel conditions. Hwy 30 was a parking lot a few times due to weather and road closures, and behind the hotel there were several large semi-trucks parking while waiting. The first room we had was on the street side, but only when it rained was it a problem as the hotel is a long way off from the road and thus quiet. When we were moved to the back side of the hotel, we heard all the diesel engines running all day and night, but with the increase in overall traffic, it seemed to be incident related. I talked to several staff members that really liked their jobs, and even fellow travelers that were staying at the hotel for long-term (due to local homes flooding and jobs). Everyone seemed very satisfied. Since we moved away 3 years ago this is the hotel we stay at when coming back to visit. 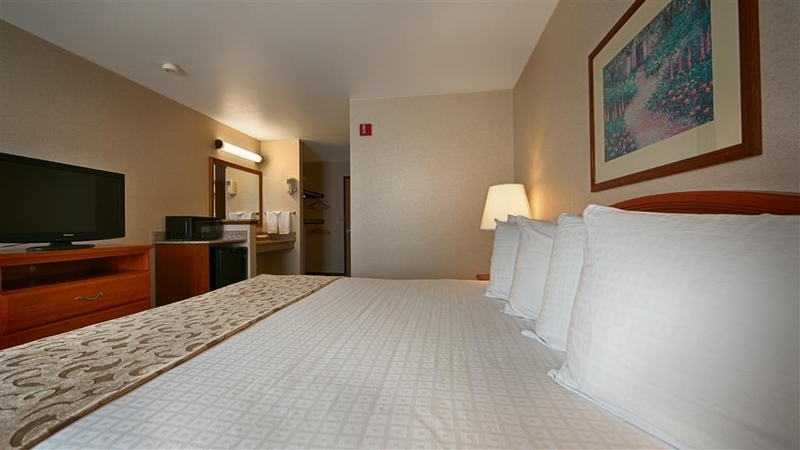 It is super clean, nice rooms and the staff are all so welcoming. The beds are really comfortable and they have an indoor pool and hot tub too! The motel is very clean, comfortable, quiet and I felt safe. My well behaved dog is welcome for an extra $20/night. If he was not allowed to stay with me I would have found another place to stay. Breakfast is a big bonus. The food was good and there was a variety of things to chose from. We stayed in this hotel because of proximity to family. It was a lovely hotel, friendly & helpful staff at the front desk, in housekeeping and in the breakfast area. The rooms were very large, clean with comfortable beds & bedding. The breakfast was great with an assortment of food items. I would definitely stay here again if visiting the area. "A place to stay for my granddaughters wedding"
That weekend must have been a very busy one for the town of St Helens. The hotel was very busy. 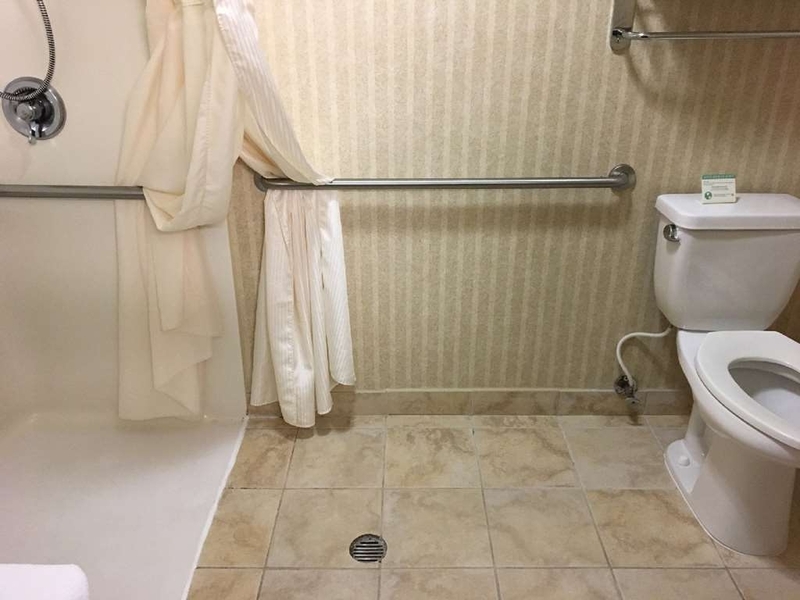 When I called and made reservations I had asked for a handicapped room. I did get a very nice room, spacious with a king size bed on the second floor, only problem was it is on the second floor and no elevator. They did offer a complimentary breakfast and it must have been good because the place was packed. I always stay at this one about 4 times a year to see my grand daughter & this is one of the nicest Hotels I have ever stayed in for over all. I have nothing to say about this place that is negative. Wonderful place & wonderful people. This was a good place to stay while visiting family on Thanksgiving. Staff is helpful and friendly. Good breakfast, warm room, comfortable bed. Staff was welcoming to our dog; and accommodated our request for first floor room. I agree with the comment about the lone recliner. It was also small; sofa would have been nice. Convenient to nearby services. Not a large choice of nice restaurants. Will try the Klondike next time we visit. This Hotel was a great value at the price point we paid. The rooms are clean and smell fresh (no smoking building)The beds are comfortable and the continental breakfast is included with your stay... it was very good! Cindy did a great job of replenishing the breakfast offerings and the coffee was always hot The pool and the pool room was clean and appeared well maintained. There is plenty of free parking, the staff is great. no complaints! Very friendly staff and a great location for us. It is absolutely the go to hotel when we are in St Helens. The rooms are very spacious and the beds are very comfortable. The hotel is set back far enough so it is very quiet. Breakfast selections are very good. The Columbia River is only a few minutes away by car. If you are looking for a very good place to eat try The Klondike in old town near the river. someone else mentioned the sad, lone recliner. It would be nice to have 2 chairs. The hotel is dated but clean. Staff was friendly and helpful, allowing me to change rooms when my first room stank of cigarette smoke. 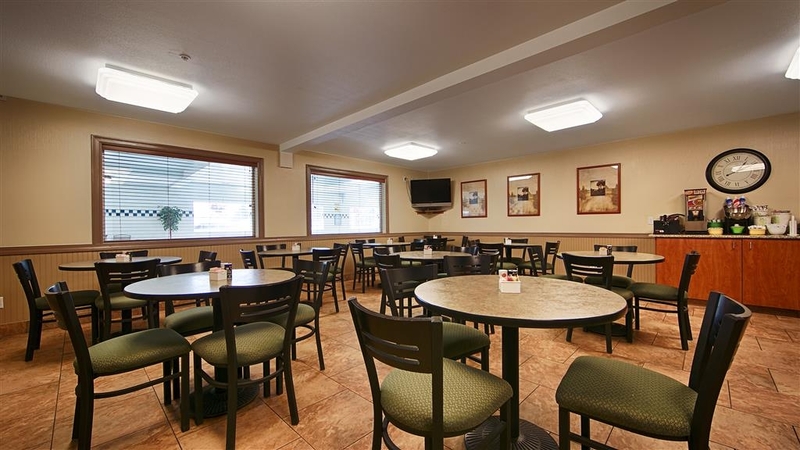 Well located off HWY 30 in St Helens, this is the best available hotel and will not disappoint. Very clean rooms; friendly staff, great pool; good breakfast. I would recommend this hotel for family and/or business stay. We stayed at Oak Meadows Best Western. Not a bad place to stay, probably the best for the area. The problem with that is that you don't have much in the way of choices. We checked our family into 3 rooms, all non smoking, yet reeking of smoke. They have alot of stairs, we were put over top, and next to one set. When I asked to be moved desk manager said we didn't have any other options. After several minutes she miraculously found two rooms a we ay from the stairs. Had to buy a bottle of fabreeze just to stand the smell. The breakfast was a very nice surprise. Food was fresh and better then we expected. The employees in the breakfast definitely went above and beyond. They were very nice, friendly and helped make our stay as comfortable as possible. "Disappointed in the Check in Process"
The hotel itself was adequate and the rooms were fine - pretty much the basic hotel standard. We arrived a little bit early, but were told our rooms would be ready at 2:00 p.m. So we waited and then at 2 p.m. we were told that they would not be ready for quite awhile yet. An hour later they were still not ready. Other guests were arriving and being told the same thing. Several other people seemed unhappy about this also. It seemed as though they had to have the whole place clean before any rooms were being released. I asked about this and the desk clerk just said "she has to inspect them first" - whoever she was. It was all very frustrating, and messed up our daily plans having to wait around and then leave and come back to check in again later. The bed was very comfortable and we slept well. It is a Quiet location Good breakfast. The waffles are yummy. The biscuits and gravy very tasty. Pleasant people and very helpful. We stayed a week and will return. "Great Place to Stay in St. Helens"
Lovely rooms. Very quiet even though the hotel was full of participants in the HalloweenTown event. We were there for an annual cat show and the pet policy was very fair and reasonable. Wifi was excellent and we enjoyed our room with refrigerator and microwave. "THE WORST RECEPIONIST THAT I HAVE HAD TO DEAL WITH"
As an over the road truck driver i called 6 hours ahead to confirm that this hotel still had rooms available and to inform them of the type of payment i was using. The receptionist informed me that they had several rooms available and would be waiting for me . when i arrived at the hotel they had no rooms available for me and could only accept cash for the few rooms still open. i decided to wait till the next day to get a room and told the receptionist that i would like to check in early to which she replied "Not before 3p.m." !!!!!!!!!!!!!! Seems kinda funny cause the check in time is 2 p.m. The room was clean, comfortable and quiet. Staff were friendly and helpful and there is plenty of parking. The breakfast has enough variety for everyone to find something they like and the pool is great. All in all a great stay. 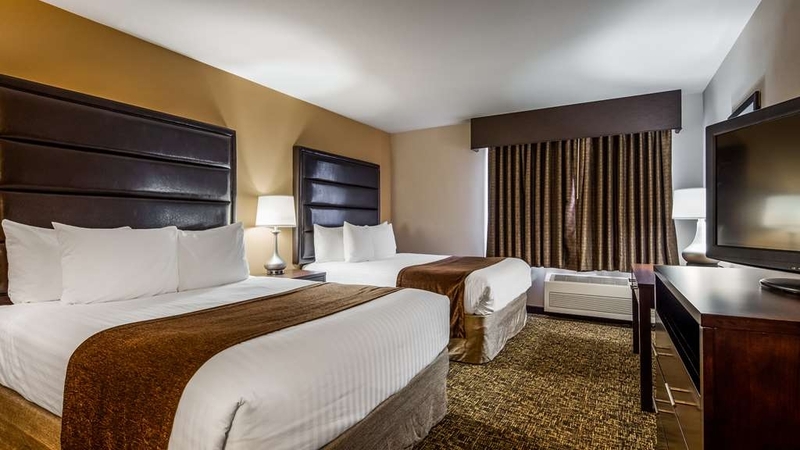 We recently spent the night at The Best Western Oak Meadows Inn and were very happy with our stay. The staff was very nice, the breakfast was hot and fresh and our room was clean. If we find ourselves in the Saint Helens area again we would not hesitate to stay here. The room was not ready when it was supposed to be. The lady said she would call when it was ready. We called to ask if it was ready twice. 2 hours after check in time it still wasn't ready. We got no call. Finally at bed time, we called again, and it was ready. Wasn't able to use the room in the afternoon to change or anything. Only was able to sleep there. Room was clean and bed was comfy. It was ok. I haven't stayed at a Best Western Hotel for several years and this week I stayed at two different ones in two days. There are not many options in St. Helens. This hotel appeared to be new-ish and it was clean. It was kind of odd how it was shoehorned into a neighborhood (the back of the hotel abuts somebody else's back yard). The room was large. The king size bed was in a portion of the room near the back window. There was another large portion of this room between the bed and the bathroom, separated by a half wall. And there was this lonely recliner all by itself in that room. And nothing else. Everything else is blank blur of name-brand hotel chains, with their convenient breakfasts and free USA Today newspapers. But for me, this hotel will always be the 'lonely recliner' hotel. 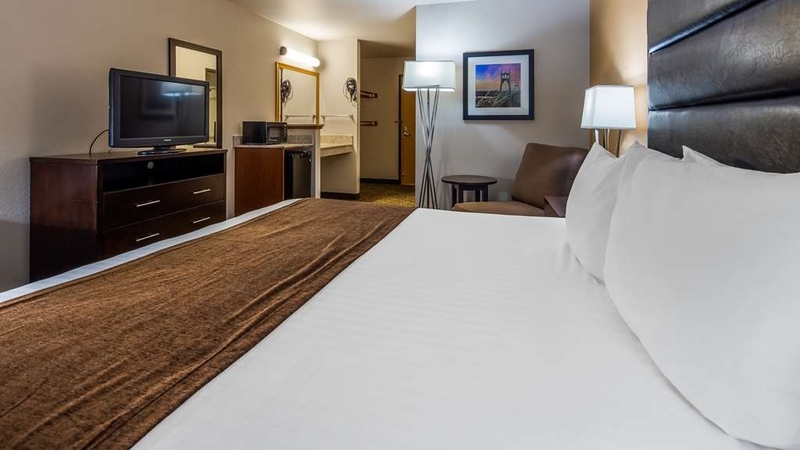 "Good value and very comfortable"
A solid Best Western experience. Very comfortable bed, as usual. A great spacious room and nice decor. Breakfast was sufficient and the staff seemed to take real pride in it. In fact, all the staff we encountered were very pleasant. Room price was reasonable. All in all, would recommend it. Our experience was one that provided friendly and excellent service, rooms were quiet and comfortable. The beds were very comfortable. The breakfast area was bright and clean, as well as having fresh fruit and a wide range of hot food including waffles that you make yourself. The exterior fits right into what you would expect in Oregon, green grass, set back away from the main road and easy access to local amenities. "Change of plans once there"
Had planned to stay three nights until arriving. The price of the hotel was way out of line for what they offered. The room was clean, however, I found trash in the drawers under the TV when I was going to put dirty laundry there. Check in staff was friendly, I wanted a room with no connecting door - they could not do that, however, they did try. did not do breakfast there because they did not have fruit other than green bananas, and mushy apples. "Best Hotel in St. Helens"
Always clean, friendly staff, and very comfortable beds. Although our room was located in a heavy traffic area, off the lobby, we had a very quiet stay. We came for the Longview/Kelso Kennel Club dog show. This hotel was VERY pet friendly.